Capital of the Republic of Indonesia, Jakarta is a huge, sprawling metropolis, home to 9 million people. During the day the number increases with another 2 million as commuters making their way to work in the city, and flock out again in the evenings. 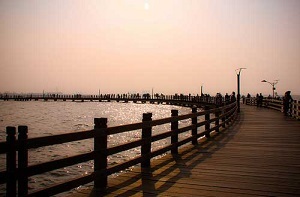 Located on the northern coast of Java, the province of Jakarta has rapidly expanded through the years, absorbing many villages in the process. In fact, Jakarta is a conglomeration of villages known as kampung, now crossed by main roads and super highways. It is small wonder therefore, that you may drive down one wide avenue one minute then suddenly find yourself squeezed into a small street together with scores of cars and motorbikes. 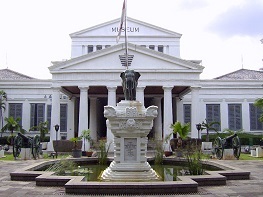 Together with its many suburbs Jakarta has become a megapolitan city. Therefore, when you visit Jakarta it is best to invest in a good map, or rely on GPS. Jakarta has two international airports, one is the larger Soekarno-Hatta International Airport, located in Tangerang, now in the neighbouring province of Banten. The other is the smaller Halim Perdanakusuma Airport, which is reserved to limited domestic flights. 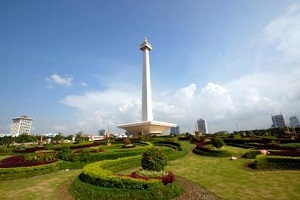 The best way to travel around Jakarta is by hired car, taxi or by package tour. 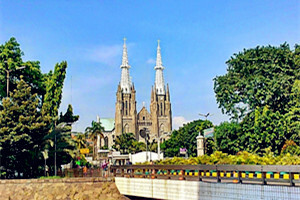 Be prepared, though, to meet traffic jams, especially when travelling during peak hours and into business districts, including the area to the Old Batavia. It is advisable therefore to choose a hotel near the location where you will have your meeting or business appointments or to the attraction or destination you wish to visit. Distances in Jakarta are far and there are frequent traffic snarls.